1. Use it as an extra bedroom. If your house has few bedrooms, you can consider using your basement as an extra bedroom. This can be very helpful when you have visitors or relatives in your home. If your bedrooms cannot accommodate the number of visitors in your home, you can allow some to sleep in the basement. In this case, you can remodel your basement and come up with a good bedroom. This goes a long way in maximizing space in your house. You do not have to be congested in your house. You can remodel the basement and make it to be a bedroom for your visitors. Kids normally like to play. If you would like to spend more time with your family, you can opt for a play-area in the basement. You will realize that your kids will love it and it will help you to keep an eye on your little ones. In addition, it will enable your kids to play in a safe and clean environment. You can actually monitor your kids as they play. This can help you create a strong bond between you and your kids.You just need to add a few gaming equipments and the area can readily be used by your kids for playing when they are at home. Most people have changed their lifestyles nowadays. You will realize that most people usually take processed foods instead of natural foods. Most of them, usually prefer taking fast foods instead of taking natural foods. This has made many people to gain a lot of weight. Some of them are even obese. This can be detrimental to your health. You will also realize that most people are not concerned with their health and fitness. Some of them do not visit the gym. This can make you to have heart-related diseases such as cardiac arrest, high blood pressure and so forth. If you normally like to exercise, you can convert your basement to a gym. You can install several fitness equipment and sports accessories in the basement. You can install a treadmill and other equipment such as ab rollers and medicine balls. This can help you to lose weight and stay fit. You can actually workout in your basement without disturbance. In addition, you can actually put a small fridge and fill it with cold, tasty beverages to cool you down after an intense workout. Everybody likes to be entertained. You do not have to watch a thrilling movie in your sitting room. You can watch it in your basement. 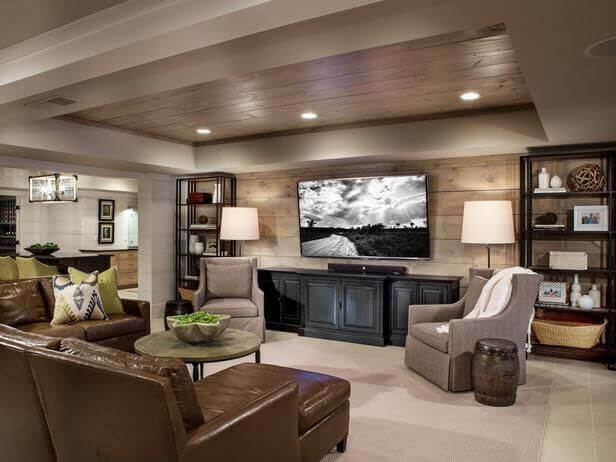 You can transform the basement into a genuine movie theatre. You can readily watch these movies with your family members and friends. You should invest in quality audio-video equipment, comfortable sofa and a small fridge filled with snacks and cold beverages. You can also put several comfortable armchairs so as to accommodate several people. You should sound-proof the basement so that your movie watching experience does not create any problem for other members of the family. Some people normally like gaming during their leisure time. If you are a serious gamer, you can transform your basement into a gaming area. You can use this area to play video games with your friends. You just need to install laptops and desktops that are specially designed to enhance your gaming experience. You can also play video games with your children. It is important that you buy quality webcams, headphones and other gaming equipment. This can help you a great deal. Most people normally like listening and playing music. Others normally have a talent in music. If music is your life, you can take advantage of the extra space in your home. You just need to hire an expert basement renovation Cap-Able Group to transform this space into a music studio. You need to buy equipment that can record your music effectively. In addition, you can sound-proof the area for you to enjoy better music quality without disturbing other members of the family. This can help you in nurturing your talent in music. Most people normally like visiting the casino from time to time. You will realize that is possible to transform the basement into a casino. You just need to install one or two poker tables. Once you install them, you can create an atmosphere of a casino. You will realize that once you have a casino in your home, you do not have to spend a lot of money unnecessarily. You can spend time with your friends playing poker in the basement. It is important that you install ambient lighting and task lighting along with an open bar. This is a great way of adding the feel of a casino to the area. You can also use transform you basement to be a mediation area. If you are a spiritual person, you can readily use this space to meditate. You do not have to meditate in your bedroom. In addition, you can it can be an ideal space for relaxation. You just need to ensure that it is well ventilated and it has adequate natural light. Those are some of the basement family room colors ideas that you should consider. You do not have to use your basement for storage purposes only. You can utilize it in a number of ways. Remodel your basement today and you will enjoy the results.